A forecast of eight knots and building opened the second day of the RYA Youth National Championships at Plas Heli. A full schedule was planned, and the full schedule was completed. There was a number a of standout performances across the classes, including Jack Butters and James King (Parkstone) in the Spitfire who had a clean sweep of wins, as did Clementine Thompson (Guernsey YC) in the Laser Radial. Crispin Beaumont and Tom Darling posted three race wins and a second, meanwhile Andy Brown’s score line was 2,1,1 in the RS:X windsurfing class. Andy Brown’s (Largs Sailing Club) racing winning form jumped him up to the top of the RS:X results list. Lily Young (WPNSA) transitioned into the RS:X just last year, and is already posting top scores, a second and third put her in sixth overall and second girl. Three wins confirm Jack Butters and James King’s (Parkstone YC) lead at the front of the Spitfire fleet. They are confident heading into the rest of the week even as the pressure build towards the business end of the week. Brother and sister pairing Sophie Heritage and William Heritage (Gurnard SC) sit in second, Caleb Cooper and Megan Smith (Grafham Water) round off the podium in third. The 29er performance of the day came from Crispin Beaumont and Tom Darling (HISC), winning three of their four races. “It was so shifty we always had to be on our toes, anyone could come from either side of the course,” said Beaumont. “In the last race we took a few more risks because we knew had an eighth to bank but it was about sailing on the lifts. Now we will have to sail championship winning standard for the rest of the week, there are no easy steps." Chasing on their heels are Bobby Hewitt and Harvey Martin (Leigh and Lowton) and brother Dan and Fin Armstrong (Royal Torbay YC) in second and third respectively. Phoebe Connellan and Sophie Otter (Grafham Water) maintain the girls lead and are fifth overall. Isabel Davies and Gemma Keers (Itchenor) have a ten point lead at the front of the 420 fleet, winning the final race of the day. Hatty Morsley and Pippa Cropley (Port Dinorwic Sailing Club) won the second race of the day and are third overall. 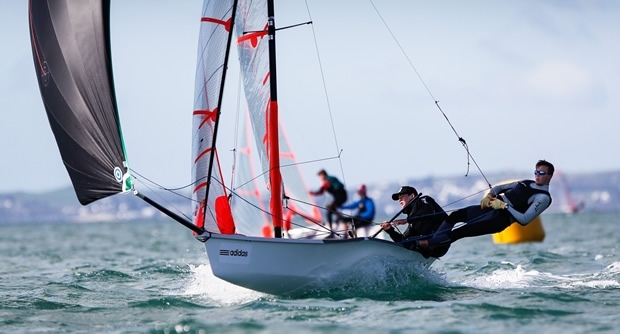 Sam Whaley and younger brother Ben Whaley from Swanage are the current front runners in the Laser Standard and Laser Radial class respectively. Having your older brother in the boat park can be the helping you hand you need after a long day on the water and a race win in variable conditions. Winning Laser racing clearly runs in the family. Clementine Thompson (Guernsey Yacht Club) jumped right up the leader board to fourth after her three wins, while Ellie Cumpsty (CVLSC) maintains the overall lead. The forecast for the next two days, is windy with squally showers so should challenge many of our sailors. Racing is planned for 11am on Wednesday 6 April for all classes.